This is a great craft project for kids. Once an adult has coated the apples, children can create crazy faces in the Halloween spirit. 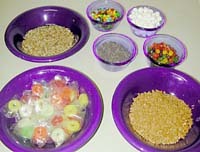 granola, chopped or whole nuts, chocolate chips, M&M’s, shoestring licorice, Lifesavers, marshmallows…you name it! Insert sticks into the bottom of the apples and set aside. Place caramels and water in a large, glass measuring cup and microwave on high for 2 minutes. Stir with a rubber spatula. Heat for another 30 to 90 seconds, until melted. Stir until smooth. Dip apples into the caramel. Use a rubber spatula to coat completely. While the caramel is still warm, dip the top of the apple in nuts, granola, etc., if desired. Turn Styrofoam cups upside down and push the wooden sticks through the bottom. Now you have both hands free to create your masterpiece! Make wacky faces using any and all available candies and whatnot. 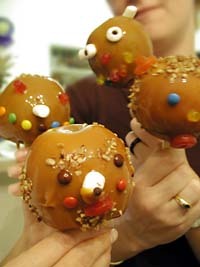 If you don’t plan on decorating the apples, allow caramel to cool slightly before coating. If the caramel is too hot, it will stick to the wax paper. 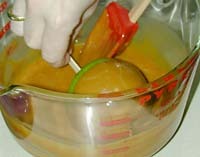 Another alternative is to dip the top of the apple in nuts before placing it on the wax paper. Have each decoration in it’s own bowl. The more the better! Place the finished product on a cookie sheet lined with wax paper. Freeze for 15 minutes. Serve immediately or refrigerate. This entry was posted on Friday, September 7th, 2007 at 1:30 pm	and is filed under Desserts, Holiday & Seasonal, Master Recipe Index, Party Food & Snacks, Speed Queen (30 min/less), Vegan or Vegan-able, Vegetarian. You can follow any responses to this entry through the RSS 2.0 feed. You can leave a response, or trackback from your own site.